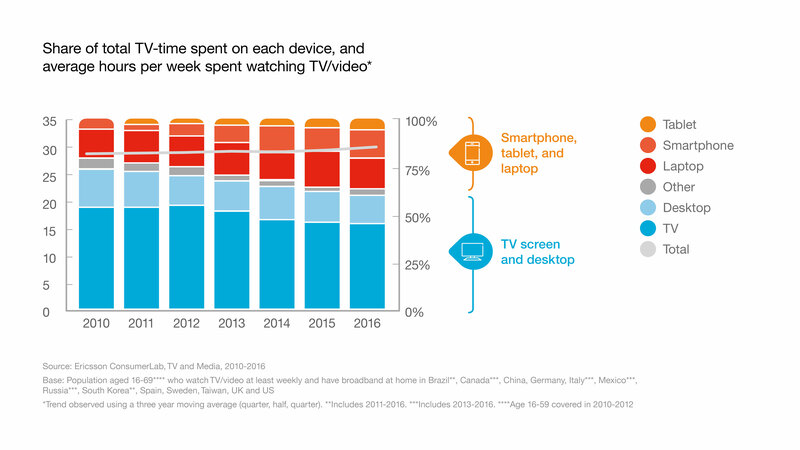 Ericsson (NASDAQ: ERIC) today launched the seventh edition of its annual ConsumerLab TV & Media Report, which details the enormous and rapid shift in TV and video viewing behavior towards mobility. The report also shows that while both mobile video and on-demand TV viewing have soared over the past seven years, content discovery remains a huge frustration for consumers. Content discovery - how hard can it be? A major issue, highlighted by the report, is low consumer satisfaction when trying to find something to watch. 44 percent of US consumers say they can't find anything to watch on linear TV on a daily basis, an increase of 22 percent compared with last year (36 percent). In contrast, US consumers spend 45 percent more time choosing what to watch on VOD services than linear TV. Zeynep Ahmet, Senior Advisor, Ericsson ConsumerLab says: "Based on our extensive research, we can see consumers increasingly ask for seamless access to high quality TV and video content, across services and devices. For consumers in general, and millennials in particular, being able to watch on the smartphone is key. Consumers not only want the shared, social broadcast TV experience, they also expect the flexibility of an à la carte on-demand media offering. Today's experience is multifaceted and consumers want to create their own worlds of compelling, personalized content." Based on interviews with 30,000 individuals in 24 countries, statistically representing the views of 1.1 billion people, the Ericsson ConsumerLab TV and Media Report 2016 is the largest study of its kind into TV viewing habits. With supporting data and insight from on-device measurements and qualitative research, the report details the latest consumer behaviors, attitudes and demands in relation to TV and Media, and the potential impact these trends can have on current industry business models. Interviews were undertaken with consumers aged 16-69 across 24 markets: Australia, Brazil, Canada, China, Colombia, Dominican Republic, Germany, Greece, India, Italy, Mexico, the Netherlands, Poland, Portugal, Romania, Russia, South Africa, Spain, Sweden, Taiwan, Turkey, the UK and the US. All respondents have a broadband Internet connection at home and watch TV and video at least once a week. Almost all use the Internet on a daily basis.